I’ve been in Budongo almost a week and I have to say the time has flown by. It’s great to be back. This morning the Sonso chimps started calling outside my front door at 0530. There is something quite magical about hearing that noise as you stir from a deep sleep. I’ve been wanting to share with you all what I’ve been up to, but there is a very poor internet signal, so I haven’t been able to publish any posts. Today the students have come to Kinyara, where there is a clubhouse. It has a pool table, good mobile and internet reception and hot food. So I am going to publish what’s happened in the last seven days retrospectively. I have taken some amazing pictures but I fear I may not be able to load them, so I will have to be selective. Before I recap on my week, I started Sunday quite unlike any other. One of the African interns, Isaac, invited me to go with him to his local church at the top of the hill in the nearby village of Nakafunju. It’s a two and half mile walk one-way and we were both soaked through by the time we arrived with the sun beating down on us. Isaac tells me it was built by Polish prisoner of war refugees (POWs) and there are pictures with Polish or possible Russian writing framed on the walls. It’s a pretty blue and white church, the paint has faded in places and it’s chipped, but the inside is clean and simple and the congregation was so welcoming. 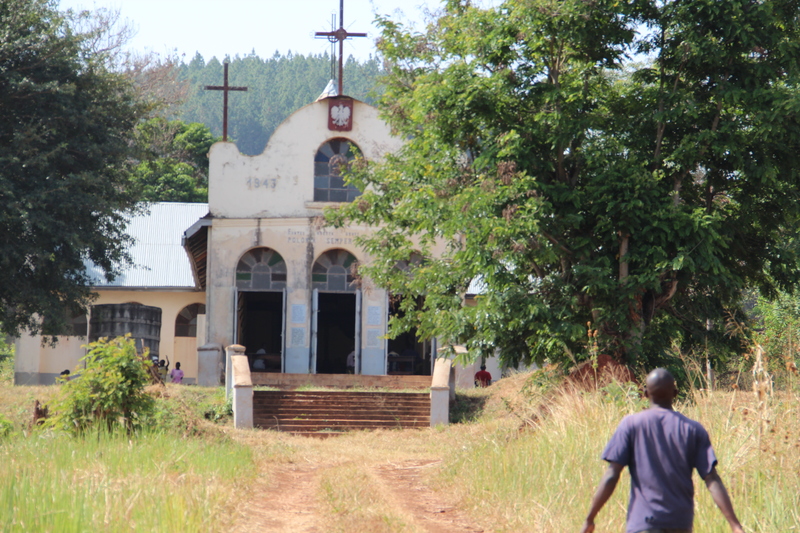 The children were shocked to see a Muzungu, they were all staring at me for the full hour and a half – I think I am the first to sit through mass. I was asked to address the crowd and I stood in front of the altar with my heart pounding in my throat and said in my pigeon Swahili: “Abari….., jinni lango Asha. Mimi motto ya schula Budongo. Sante sana.” Forgive the spelling, I’m writing it phonetically – which means: How are you? My name is Asha and I am a student in Budongo, thank you for having me. I got a round of applause and many congratulations after the service for my attempt at communicating to everyone. At the end of service there was a small food auction. Villagers who had donated food to the church then offered it up to the congregation with the highest bidder taking home the spoils and the money going to the church kitty. 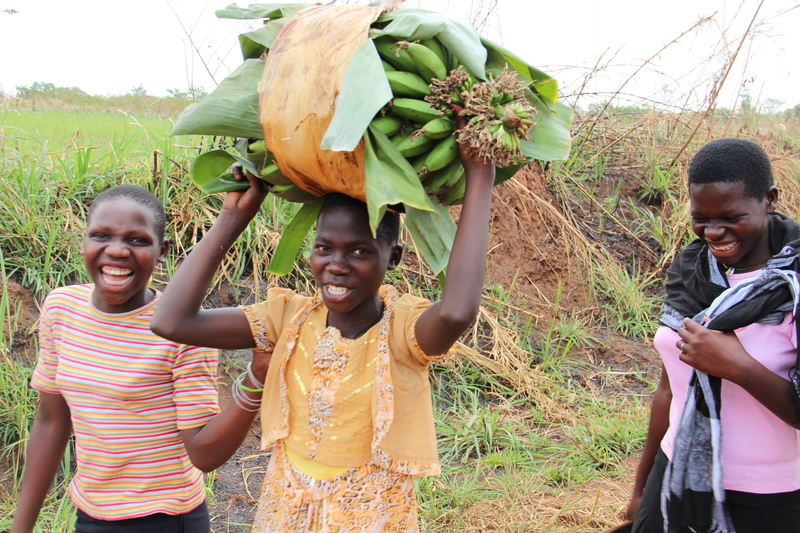 We bidded for a bunch of green bananas and won at 4,000 Uganda Shillings (just over a £1), the problem was we then had to carry it back two and half miles back to camp. Some schoolchildren wanted to help and bless, the, carried it as far as the end of the road. En route we stopped a number of times, huffing and puffing. Ah well at least we will have something nice to eat during the week. Matoke (boiled and mashed green bananas is a Ugandan dish). One thing is for sure I will be as fit as a fiddle when I get back to the UK. I’ll sign off now and hopefully publish more posts this time next week. It’s good to hear from you. It’s been a week since your last communication and I was beginning to think that something untoward had happened. It’s supposedly the warmest day of the year here, but I would hazard a guess that’s it’s sweltering where you are now.